Gallup recently released a report, What America Needs to Know About Higher Education Redesign, which offers some insight on the level of career readiness of today’s graduates. 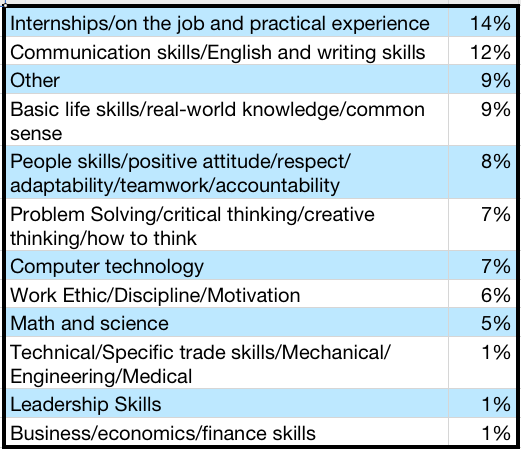 The survey also asked business leaders “In your opinion, what talent, knowledge, or skills should higher education institutions develop in students to best prepare graduates for success in the workforce in the coming years?” The results are summarized in the table below. In the Olympics and your career, 2% = GOLD! I really enjoy the Winter Olympics and will spend a lot of time watching even some of the more obscure events– curling? The television coverage is so good that we get to see these events from Sochi, Russia better than many of those who are there in person. I was watching men’s speed skating and the camera work really captured the speed at which these athletes flew across the ice. I am not a big speed skating fan, but the event was great. These are the official results from the Olympic Men’s 1000m Speed Skating competition in Sochi. 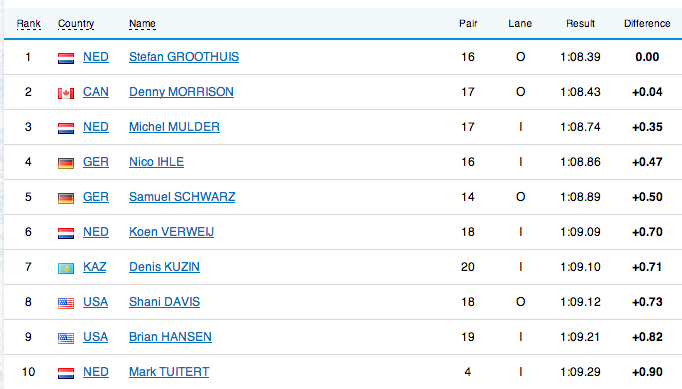 Less than 1.0 second separates the top 10 finishers. The entire event takes just over a minute, so the differential is less than 2%. These athletes spend years training for their event. Practice and training are not only for athletes. What skill can you practice today that will give you that 2% advantage in your career? http://career-ology.com/wordpress/wp-content/uploads/2015/01/Career-ology-logo.png 0 0 Jeff Chapski http://career-ology.com/wordpress/wp-content/uploads/2015/01/Career-ology-logo.png Jeff Chapski2014-02-17 10:51:402014-02-17 10:51:40In the Olympics and your career, 2% = GOLD! How many millions are in a trillion? Do you know how many millions are in a trillion? According to Econ4u.org (Employment Policies Institute), only 21% of the people in a national poll answered the question correctly. That’s not good. You definitely want to know the answer to this question and here’s why. . .
http://career-ology.com/wordpress/wp-content/uploads/2015/01/Career-ology-logo.png 0 0 Jeff Chapski http://career-ology.com/wordpress/wp-content/uploads/2015/01/Career-ology-logo.png Jeff Chapski2014-02-13 12:18:532014-02-13 12:18:53How many millions are in a trillion? Subscribe to the blog and receive 2 free chapters of the book! Why does “networking” get a bad rap? John Keyser on Underemployed? Argh! Now what? Subscribe to the mailing list and receive 2 free chapters of the book! © 2019 Career-ology. All Rights Reserved.